This Wonderful 2 bed 1 bath basement level apartment is part of a larger home in the north end of town and has a separate private entrance from the main home. We want you to have the best vacation experience possible. All of our rentals go thru a 200 point checklist and are professionally cleaned between each guest visit. The kitchen has stainless steel appliances and all the necessary dishes, silverware and appliances to make your stay comfortable. The 2 bedrooms have queen beds and the living room has a queen sofa sleeper. The master bedroom has a large walk in closet with mirror doors. The living room has a flat panel TV, cable and wireless internet. The bathroom has a tub with shower, tiled floor and washer and dryer. We are an A+ rated BBB member and take care of our guests. Thanksgiving and Christmas 5 night minimum stay. Air force graduation 7 night minimum stay. We only take reservations up to a year in advance. Please note for reservations under 45 days in advance, credit card payment must be made in same name as the reservation holder, otherwise we will not accept the reservation. 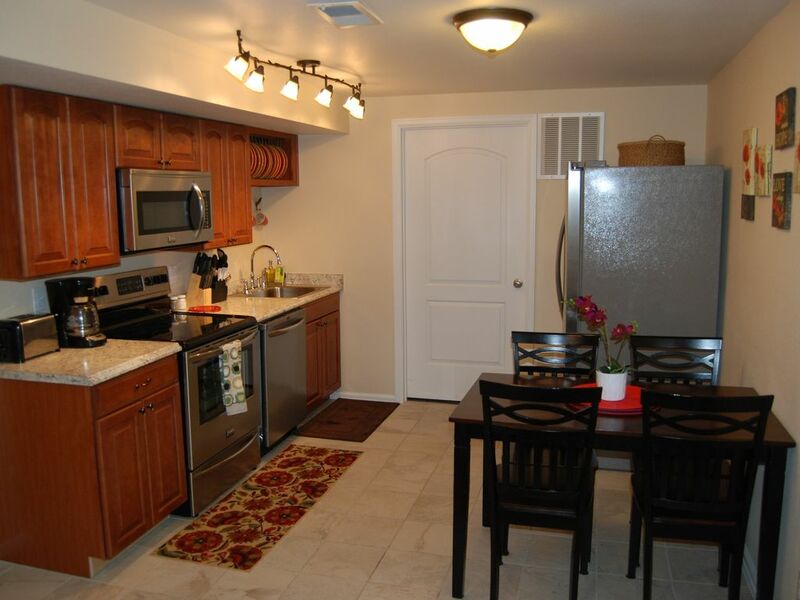 Stockton May Holdings Property Management has been offering high quality furnished rentals for several years. We are there to answer your questions and needs because we want you to have a great vacation experience in Colorado Springs! Great location in North end of town in an established neighborhood with mature trees. Close to Air Force Academy (10 minutes) for events and not far to all the Major tourist destinations in town (25 minutes). Central heating is controlled from living room thermostat. Living room has a queen sofa sleeper, flat screen TV, cable, DVD player and WIFI internet. Cable provided. Access to DVR recording provided. Outrageous fees, 3 star property at 5 star price, undisclosed negatives, will not rent again. This property had no surprises and pretty much was as advertised. We stayed 4 nights in late August and the whole house was comfortable climate wise. Like everyone else’s review, Robert was quick to respond and offered help when needed. If you’re concerned about the area, the property was in a nice quite neighborhood and met visual appeal. Everything was in nice working condition and the property rating would be comparable to that of a 3 star motel; very basic property inside. The negatives are, we arrived earlier than expected to Colorado Springs and asked Robert what was the earliest we could check in, and his response was, “there would be a high per hour fee for every hour before 3:00 pm and we would have to pay in full upon our arrival.” We were very disappointed at his unwillingness to accommodate us! The upstairs is also a rental, so you’re at the mercy of the people staying above you for a good nights sleep. I could hear the gentleman snoring upstairs above my room and anytime he used the bathroom, it included a very loud flushing of the commode. Every step, every door being closed you could hear. I could clearly hear their conversations as well. The other issues are the beds. The mattresses were comfortable, but the box springs are of poor quality. Any movement you made, the beds snaps, crackles, and pops. I slid the mattress over and pressed down on the box spring and found it to be the culprit. Anytime I would move I’d wake my wife and vise versa. Also, they asked for a four digit deposit (that was four times more expensive than we’ve ever paid before) and you’re or forced to buy an additional expensive insurance instead. At the price we paid, it was not worth the money. 5 star price; 3 star property rating. Based on the expensive hidden cost, outrageous cleaning fee, upstairs being a rental, and the cramped living area, we’ll never stay at this management property nor recommend it to anyone else. Our cleaning crews work at the properties between check out and check in (10-3). We accommodate early check ins and late check outs when scheduled in advance, at the low rate of $10 per hour at any of our properties. Since the guest asked for early check in on the day of arrival while the cleaning crew was there, it was not possible. Either low cost insurance thru VRBO or equivalent cash deposit for the insurance amount is required. Almost all guests go for the insurance, since it gives them peace of mind that they won't have to pay for accidental damages. Some guests prefer the cash deposit so to save the $59 fee. This insurance price is set by VRBO. The rental size is over 800 square feet, as indicated on the listing, with large bedrooms (12' x 12'). Detailed pictures of the entire rental are on the web site so you know what you are getting. We just replaced the sofa bed with a nice memory foam bed before this guest arrived. We will check the other beds to make sure there isn't a problem with them. We always ask every guest if there is anything that needs our attention, the day after check in and we even made a special trip to bring this guest extra linens and blankets. We could have addressed any of the concerns this guest had if they had let us know about the issues. This unit comes well furnished for the weekend or a longer term stay. I'd highly recommend this beautiful unit. Mr. Robert was so helpful when it came to me having questions about the property. He is always available! I would definitely be staying here again when I return to Colorado Springs! All thumbs up for me! Thank you for the great review. Glad you enjoyed the rental. Beautiful rental. Good location. Would rent this place again. Nicely finished basement. Had everything we needed. Basement Apt was nicely finished and had everything we needed and expected. The below ground level made it cool day and night. We would stay there again! Very clean and organized management. Cancellations 60 days or more before check in receive full refund minus $100 cancellation fee and any VRBO fees. If we can re-book property we will refund any portion for days that are re-booked minus the cancellation fee. House Rules The following list reflects the general policies of rental for all of our rental properties. Our properties are non-smoking residences. You may not smoke or grow Marijuana at the property. If you smoke cigarettes, it must be outside the building and you must clean up the butts. Pets are not allowed at our furnished rentals. Violating the smoking or pet rule will cost you a minimum of $600 cleaning plus any rental days we can’t rent the property. Illegal drug activity will not be allowed. Failure to abide by this rule will result in eviction, arrest and forfeit of deposit. We do not allow weddings, receptions and other large group events at our rentals. Tenant may not sublease property. Please wash your dishes before leaving. Your cleaning fee does not cover this.